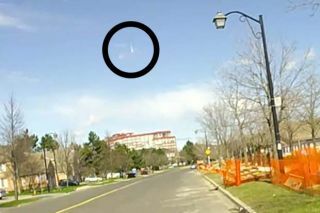 David Narciso's dashcam captured a daytime fireball streaking through the sky above Toronto. A brilliant fireball surprised some skywatchers Sunday (May 4) when it streaked across the daytime sky over Toronto in a celestial fireworks display caught on camera by lucky motorists. A well-placed dashboard video camera captured the light of the bright meteor, which could be seen from parts of Canada and New York on May 4. The daytime fireball video shows a clear view from a parked car with people chatting in the background. The meteor comes streaking down from the top of the sky at about the 22-second mark, with a clear outburst of light occurring at about 24 seconds. The fireball is concurrent with, but may not be related to, the Eta Aquarid meteor shower set to peak tonight (May 5) and into the wee hours of tomorrow (May 6) morning. The annual shower happens when Earth passes through debris left behind by Halley's Comet. This year, the meteors will probably appear low on the horizon, but even if you don't have ideal viewing conditions, you can still watch the shower live on Space.com via webcasts from NASA and the Slooh community telescope. So far, the American Meteor Society has received about 84 fireball sightings, with some claiming to have heard a sound concurrent with or after the fireball streaked through the sky. This daytime fireball also marks the third event of its kind in the last few days, according to the AMS. "Oddly, this event, marks the third significant fireball in the last three days, following a relative slow season for fireballs so far this year," Mike Hankey wrote on the AMS website. "A large fireball with numerous sonic booms fell over Arkansas on Friday night. Another bright fireball was seen over North Carolina Saturday night and this daytime fireball over Ontario marks the third significant event for this weekend." When a piece of asteroid or comet is in space, it's known as a meteoroid. If that bit of cosmic dust burns up in Earth's atmosphere, it's known as a meteor, and any bits of meteor that impact the planet's surface are called meteorites. Editor's Note: If you have an amazing picture of the fireball, an Eta Aquarid meteor, or any other night sky view, that you'd like to share for a possible story or image gallery, send photos, comments and your name and location to managing editor Tariq Malik at spacephotos@space.com.